Free Water Systems | What is a Fire Cistern? What can FreeWater do for you? What is a Fire Cistern? Most of our planet’s surface is covered in water, and while this is true, much of it is concentrated in our oceans, or in aquifers below the ground. Water may be abundant, but having it readily available is a task that humans have been struggling with since the dawn of time. Irrigation was a major step forward, but even with all of our modern feats, water is still not readily accessible in many parts of the United States. Of course, drinking water may be available, but what about massive quantities of water in case of a fire? This is where fire cisterns come into play. 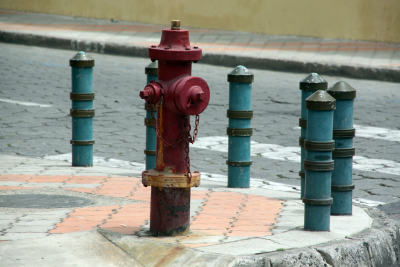 Even in crowded cities with numerous fire hydrants and winding pipes, there’s always the chance that something could go wrong, that something could malfunction. This risk is always apparent, and without a backup water source in place, a town, city or even a home could find itself in a truly adverse situation. To properly protect and serve the people of any given area, many fire departments are installing a fire cistern in their area, so that massive quantities of water are readily available in an emergency. This specific type of cistern acts as a year round water supply for firefighting. They are used in both major cities, and rural areas where central piped water supplies are not present. The National Fire Protection Association, or NFPA, has released specific guidelines for the location and capacity of a fire cistern. These guidelines are based on the size and structure of the area that it is targeted to protect. Frontenack Engineering (Missouri) – Employs a 60,000 gallon tank for fire protection in rural land developments. As you can see, these underground tanks range in size, but all of them provide a valuable asset to the fire department, and a peace of mind to the people living in the area. There is also a major benefit to homeowners as well: having one of these installed in your area can also lower your homeowner’s insurance rates because of the increase in safety and preparedness. Who Is Responsible for Installing Fire Cisterns? There is plenty that homeowners can do to expedite the process and ultimately lower their insurance premiums. Areas that are landlocked or rural are prime locations for a cistern. A perfect example is a fire cistern that was installed a few years ago on King Street in Connecticut. This cistern was installed after the fire department went out seeking natural water resources in the area. A local resident offered his property as a site for the fire cistern, and through a number of grants, in addition to the department’s operating budget, a 30,000 gallon tank was installed to provide a reliable source of water in an emergency. If you feel that your area needs a fire cistern installed, contact your local fire department and make your voice heard. There are many avenues which can be pursued to facilitate the installation of one, it only takes some consciously aware homeowners to make it happen. The patented OcTank system from FreeWater Systems is the ideal choice for any and all fire cistern needs. This unique design is made from polyethylene modules that are fastened together into a single monolithic tank. These can act as reliable fire cisterns, and are part of many rainwater harvesting systems that can replenish the tank while it’s not in use. With the major benefit of lower insurance premiums, homeowners have nothing to fear from a fire cistern. If anything, they should welcome the idea not only for the benefit, but for the peace of mind. FreeWater Systems is ready and willing to design a complete cistern system in your local area. Prospective fire department representatives can visit the website for a free, no-obligation quote. If an emergency strikes, the fire department needs a dependable source of water to pull from, and a fire cistern is the perfect solution.